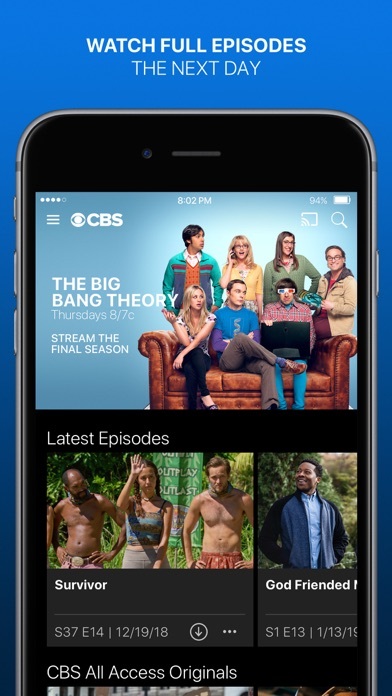 Share CBS - Full Episodes & Live TV with your friends ! 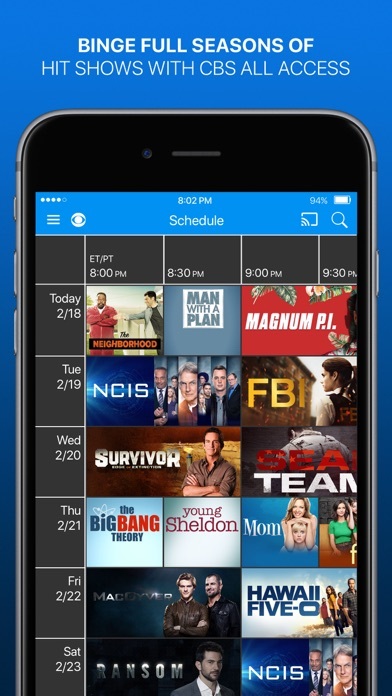 What is new in CBS - Full Episodes & Live TV? 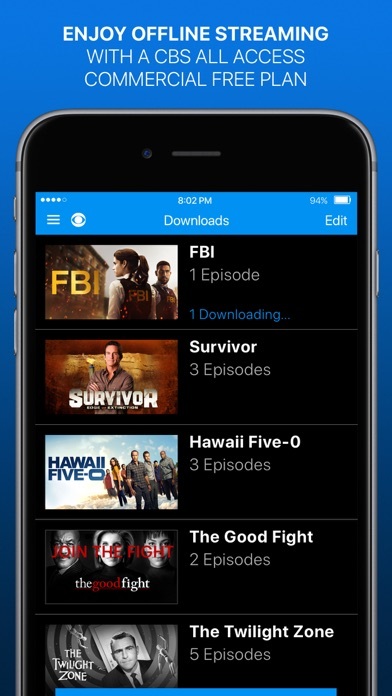 Stream full episodes from your favorite shows the day after they air for FREE! Plus, when you subscribe to CBS All Access, you’ll unlock more than 10,000 episodes, exclusive original series and live TV, including college basketball and the PGA Tour! Catch up on the latest primetime, daytime and late-night episodes in HD. Enjoy groundbreaking original series, including Star Trek: Discovery season 2 (new episodes Thursdays), The Good Fight season 3 (3/14) and The Twilight Zone (4/1), with more exciting originals on the way! 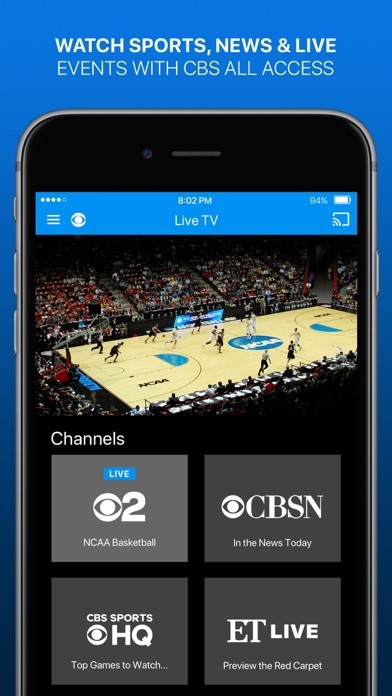 Stream college basketball and golf, including the PGA Tour, LIVE all season long across devices. Watch new series like God Friended Me and FBI live and on demand! Plus, don’t miss hits like Young Sheldon, Survivor, SEAL Team, the final season of The Big Bang Theory and more. 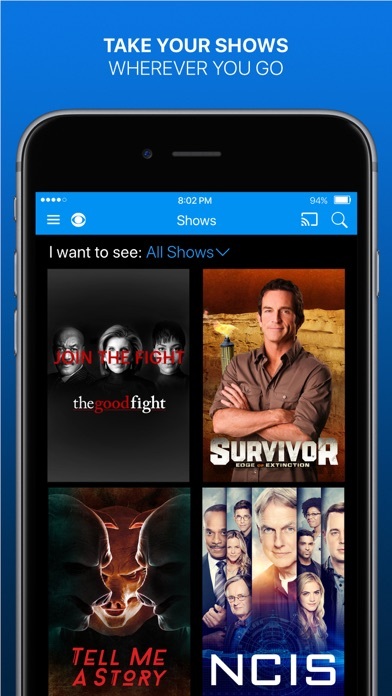 Be in-the-know on-the-go with access to 4 channels of LIVE TV: your local CBS station, 24/7 news coverage on CBSN, live scores + highlights on CBS Sports HQ and 24/7 entertainment news on ET Live. Binge classics like The Twilight Zone, Star Trek, I Love Lucy, CSI: Miami and more! 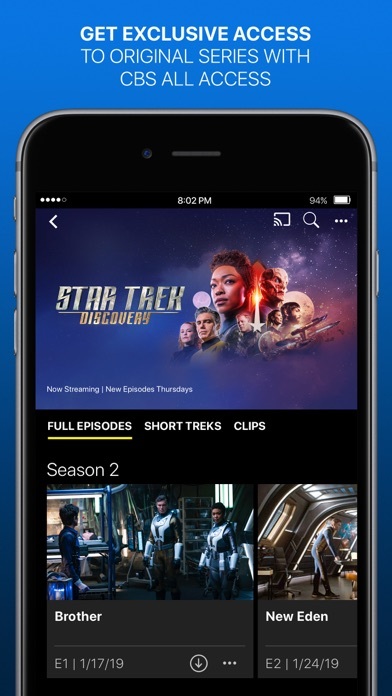 Commercial-Free subscribers can now download and stream select episodes offline with Download & Play. Payment will be charged to iTunes Account at confirmation of purchase. Subscription automatically renews unless auto-renew is turned off at least 24-hours before the end of the current period. Account will be charged for renewal within 24-hours prior to the end of the current period at $5.99 per month for the Limited Commercials plan and $9.99 for the Commercial Free plan. You can manage your subscription and auto-renewal by going to your device Account Settings after purchase. If subscription is canceled, cancellation will be effective at end of then-current subscription period. No refunds. Any unused portion of a free trial period, if offered, will be forfeited when you purchase a subscription to CBS All Access Commercial Free.